Since my last blog post about our garage sale, and our continuing efforts to rid our lives of a lot of "stuff" we do not need in preparation for fulltiming in (now less than) 15 months, we have covered a lot of ground! Now, that was one LONG run on sentence! In mid May I flew up to Spokane, WA to visit my sister and her family while Elaine went on a women's retreat near Canon Beach, OR. 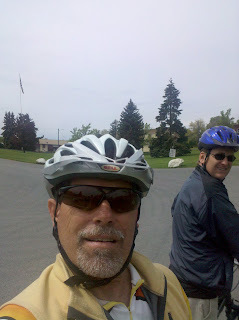 I spent about 6 days there bicycling around the Spokane area with my sister, Hilary, and her family. Spokane is really a very beautiful place, and there are so many things to see, and every kind of outdoor activity you can imagine. I spent one day playing 18 holes with Hilary's husband, Bob....haven't played in 10 years, and I still have all those bad habits! During my stay there my Blackberry gave up the ghost, so I was "forced" to by a Droid....oh my goodness.....it is like 100 times faster than the Blackberry. 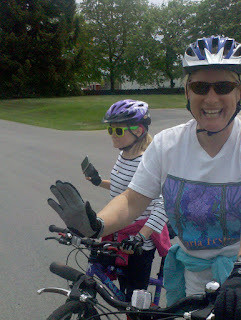 All of the pictures in this installment of our blog were taken with the camera option on the Droid. I like the quality of both the still camera, and video camera options. In addition, I loaded all the music from my Ipod to the Droid, so I have eliminated two separate items I need when travelling...the Ipod, and my camera. I only need the Droid now. 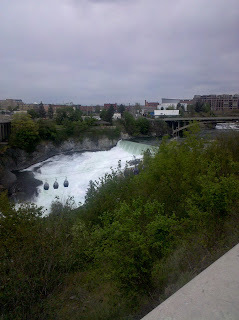 Spokane River and Falls in downtown Spokane....note the 3 gondolas visible in the lower left of the picture. 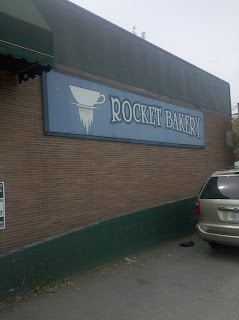 Rocket Bakery....a local institution, and a reputation well earned! Shorly after our return from our "trips" to the Pacific Northwest we headed out for a long Memorial Day weekend with family and friends in our respective RV's. 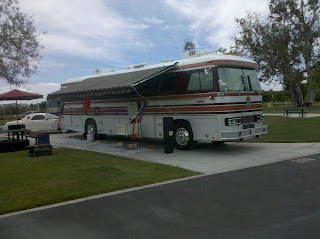 In all we had 6 RV's at Rancho Jurupa Regional Park for the long weekend (5 motorhomes, and one travel trailer). We watched Boston trample Orlando in game 6 to advance to the NBA finals, and the next night watched the Lakes do the same to Phoenix in their game six. Set up by 11am on Friday! I called the RV park Friday morning around 9:30am and found out we could check in anytime we wished, so I headed over the ARCO station and put $400 worth of diesel in the near empty tank of the Newell...that got us almost to full! 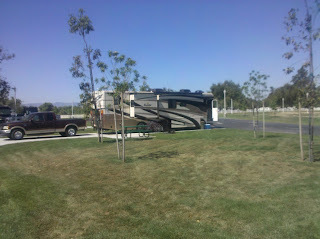 Then we headed over to the RV park and got setup by 11am. My brother Philip and his wife arrived around 2:30pm. Philip is in the picture below with Elaine cooking breakfast the next morning. Part of our extended family - Rex and Joyce. They have a Fleetwood Bounder with a couple of slides. Our long weekend ended on Monday and we headed home to unpack and prepare for our flight to Austin, TX the next afternoon. The purpose of our trip was to attend the high school graduation of our niece, Sarah Katharine Parker from the Griffin School, a small private arts school. There were 16 kids in Kate's graduating class, and the cool thing was as each graduate was given their diploma someone, chosen by the student, from their family, or faculty, got up and spoke for 5 minutes about the graduating student. Very, very touching, as well as very humorous at times. Laureen took us out to do a little site seeing, and while out we paid a visit to the well known local camera experts at Precision Camera in downtown Austin. She is heading to Taiwan on business the day we leave to fly home, and needed a new camera for the trip. As is turned out they did not have the camera in stock that Laureen wanted so she paid a visit to the local Best Buy and they did. Precision Camera will match anyone's price, however. 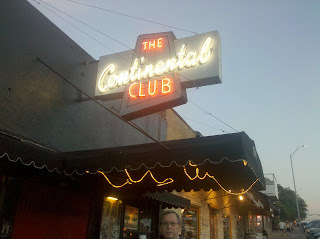 Later that evening we returned to downtown Austin on South Congress street to listen to some blues music at The Continental Club, a local institution since 1952. If you are ever in town be sure to check out this funky club. Afterward we walked around South Congress enjoying the atmosphere and the humidity (hahaha! ), ultimately stopping in Guero's Taco Bar for a late dinner. They have an outdoor garden with a bandstand, and on this evening a group was playing 50's music....a lot of Chuck Berry....an who doesn't love Chuck Berry? My brother-in-law, Glen Parker, in front of The Continental Club in downtown Austin on South Congress Ave. Listened to some great blues music. 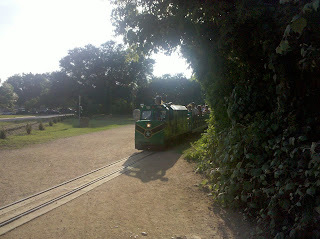 On Saturday we headed over to Town Lake in downtown Austin to take a 3 mile hike around a portion of the lake. This is a great local asset, and the citizens really use it.....there were runners, bicyclists, kayakers, canoers, as well as many just walking. I think the humidty was in the 70's, and the temps at 7pm were in the 90's....very, very muggy! After the walk we were ready for something cold so we headed over to Sandy's for some dipped ice cream cones. 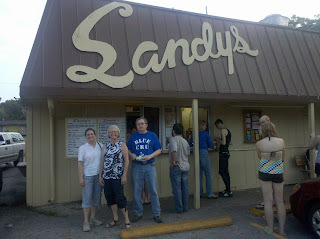 The famous Sandy's....great dipped icecream cones! A few months after we bought our Newell we met Michael and Georgia who own a 1992 42' Newell. 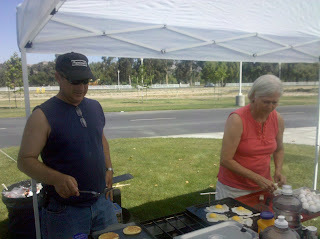 They fulltime in their Newell, and we met them in Newport Beach, CA where they were for the winter of 2008. They are now in Austin, TX at the same RV park we had our min-rally in April 0f 2009. 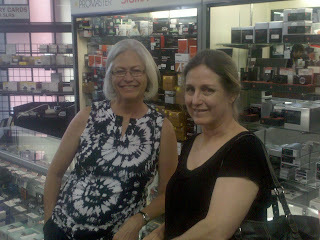 We couldn't come to Austin without spending a few hours visiting with them and catching up on their adventures. 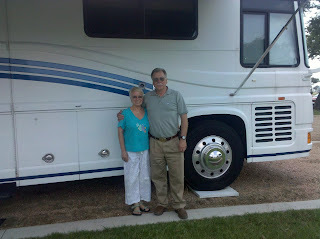 Our good friends Michael and Georgia Day, the first Newell owners we met after buying ours. And, of course, the main reason for our visit....Katie's graduation.....from left to right, Laureen (Mom), Katie, Jeffrey (Son), and Glen....very proud father! Katie graduated from the Griffin School in Austin, TX.